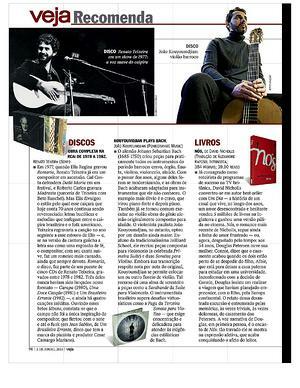 Brazilian weekly magazine VEJA recommends "Kouyoumdjian Plays Bach: New Transcriptions for Guitar" (Pomegranate Music). The CD is available worldwide on CdBaby and Amazon and the download is available on iTunes, Amazon and CdBaby. In Brazil the CD can be purchased at PopsDiscos (www.popsdiscos.com.br), located at Rua Teodoro Sampaio, 763, São Paulo - SP.